The holidays are a traditional time for family to gather and celebrate. 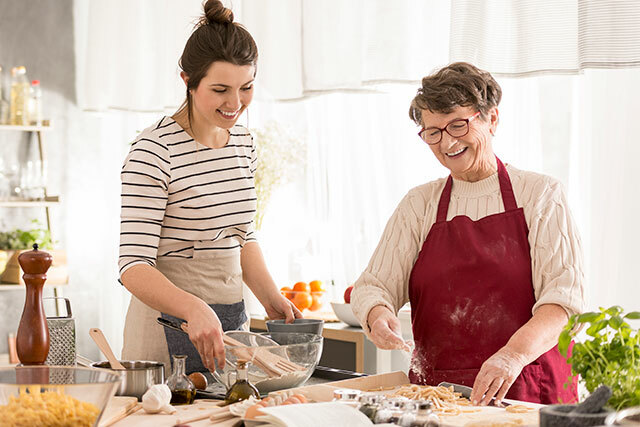 Sometimes, getting together with loved ones — parents, grandparents, or even close family friends — when they live in a senior community can be a challenge. Most senior communities sponsor and host events for family and friends to attend with their loved ones. Here are just some of the ways you can celebrate with your loved ones this holiday season. 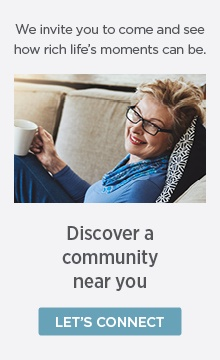 Senior communities host a range of programs and activities around the holidays and most of them welcome family and friends to join in. In Minnesota, for example, all of The Goodman Group managed communities partner with Beyond the Yellow Ribbon and sponsor an annual toy drive (called Toys 4 Military Kids) to support military families. Residents and their guests distribute the toys to the children, an activity that brings smiles all around. Some communities sponsor craft- and gift-making events that are perfect for grandkids to share with their grandparents. Another favorite is a holiday baking event that can be just for fun or, like the toy drive, can benefit a particular cause through a bake sale. You can often find holiday theater and talent events that are either sponsored by the community or are actually put on by the residents themselves. These are popular events for the whole family to enjoy. Most communities also sponsor holiday dinners that families and friends are welcome to attend for little or no cost. Every community is different, so if you’re looking for a special way to spend holiday time with your loved one, be sure to call ahead to find out what activities are offered. Many communities also have a newsletter that you can subscribe to that will keep you up-to-date on activities throughout the year. Often, senior communities host various faith-based programs. A perfect example is the Hanukkah dinner held every year for Regal Palms, Sabal Palms Health Care Center, and Cypress Palms in Largo, Florida. “For Hanukkah, we have an evening lighting of the menorah and a featured program of a choir from the local synagogue,” says Rebecca B., Spiritual Care Director. “Our residents sing a lot of the familiar songs and we have festive food for the holidays — potato latkes and jelly donuts,” she continues. For 80 or so residents, it’s a way of maintaining and sharing tradition. Other faith-based activities in many senior communities include Christmas carol sing-alongs and traditional worship services. There are often also non-denominational celebrations that honor the season and the unity of all traditions. Frequently, senior living communities have activity rooms that they’re happy to rent out to families who want to hold a private event. This is an especially good choice for larger families or those who are coming from many different locations. Check with your loved one’s community to see if this might be an option for your family’s next holiday gathering. However and wherever you and your loved ones spend this year’s holidays, The Goodman Group wishes you a safe, happy, and peaceful season.